System Recordings released Sasha & John Digweed Present Delta Heavy, a DVD documentation of the most important DJ tour to ever hit America. Delta Heavy was the groundbreaking electronic music tour featuring the extraordinary DJ talents of Sasha, John Digweed, and Jimmy Van M. Visiting all corners of the States in 2002, the tour - promoted by Clear Channel - was attended by more than 85,000 people in six weeks and was voted by the American public as Best Event at DanceStar USA 2003. Along with touring acts The Chemical Brothers, The Prodigy and Underworld, Sasha & John Digweed are responsible for America’s mid-90’s dance music explosion. As a launching pad, their monthly residency at New York City’s famed club Twilo was a larger than life event that drew fans from all over the world. This was a cultural phenomenon that lifted the DJs to an almost mythical status across the country and opened the doors for a wave of other top international DJs. Despite releasing several popular mix CDs and playing to crowds in other cities, Sasha & John Digweed couldn’t possibly reach all their fans in a vast land like America. As a result, Sasha & John Digweed’s protégé Jimmy Van M. conceived a massive first-of-its-kind touring electronic music event. The revolutionary event was called Delta Heavy. 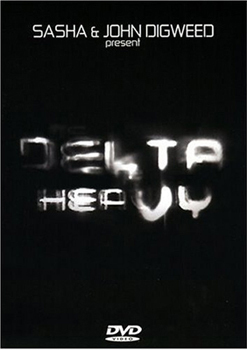 Kicking off spring 2002, Sasha & John Digweed’s Delta Heavy Tour was the most important DJ tour to ever hit America. Produced by Warped Tour creator, Kevin Lyman, the 31 live dates forever raised the bar for large-scale electronic music events. Technically produced like a rock concert, complete with touring sound, lighting, staging, laser and video production courtesy of award winning designers Imaginary Forces, Delta Heavy catapulted Sasha & John Digweed into arena headlining status. Produced and directed by Ben Turner, who has championed electronic music worldwide for 15 years, and executive produced by Sasha & John Digweed themselves, Delta Heavy is a compelling and intimate documentary film that takes the viewer behind the scenes of the largest DJ tour ever mounted in America. Featuring over an hour of exclusive live footage and interviews plus bonus materials with Sasha, John Digweed and co-creator/opening DJ Jimmy Van M, Delta Heavy is a must-have remembrance for those who were there and an essential purchase for all Sasha & John Digweed fans everywhere.